Does it make sense to use a pair of NTG3 instead of a rode NT4 to record the stereo ambiances? WIll it improve my audio quality and options to play around? What are your thoughts? I have the NT4 and the the NTG4+ and do some field recording for FX, ambiences etc. Of course you could use two NTGs for stereo ambience, but personally I wouldn't. Many of the conventional stereo miking configurations wouldn't apply due to the pickup pattern of these mics. Experimentation would be necessary and even then I'm not convinced that you'd get the sort of even ambient 'wash' of sound that ambience recording begs for. I love my NT4 for ambience. In fact I prefer to work in stereo if I possibly can. But for wildlife etc 'reach' and noises-off can then become an issue. The only thing against the NT4 in a blimp is the weight! I know it may not suit the budget - it doesn't suit mine - but have you thought of investing in an MS configuration for ambience recording. You can get small, light, good quality mics that will fit easily in a blimp and Rycote produce loads of specific fittings for them. There are also some really good stereo shotguns that use the MS technique. The advantage of MS is that you can adjust the stereo width down to zero should you choose. Depending on the mic that's field-selectable or adjustable in post-production. Thanks for taking your time and for your considerations. Would you mind suggesting some option for a M/S configuration? I have a Rode Blimp, maybe the mics can fit in it too? hcdjp wrote: Does it make sense to use a pair of NTG3 instead of a rode NT4 to record the stereo ambiances? WIll it improve my audio quality and options to play around? What are your thoughts? No and no, in that order! 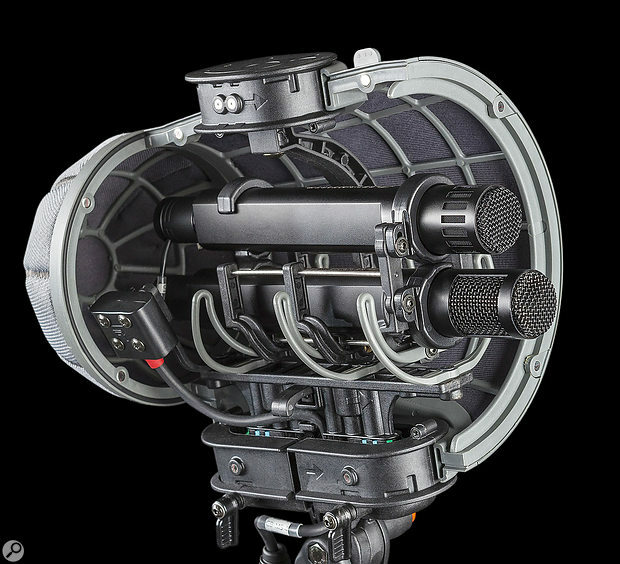 The NTG3 is a shotgun mic -- a mic with an interference-tube fitted in front of the capsule. As such, its polar pattern resembles a squashed spider which changes shape dramatically with frequency. Consequently, using a pair for XY stereo results in a rather unstable stereo image. It is sometimes done, but usually only in very specific situations (you can see that idea employed for the Wimbledon Tennis coverage quite often, for example). Moreover, the enhanced midrange directivity of an interference-tube mic means that your stereo pickup will be focused on a smaller portion of the total sound stage, rather than picking up a wider sense of true ambience. The NT4, with its near 180-degree pickup, is far better for true ambience recordings. Back-to-back cardioids or spaced omnis often work even better simply because there is no centre focus at all. Then there's the practical issue of XY stereo recording with interference-tube mics. Although the mutual angle between mics would end up being relatively small (to avoid a hole-in-the-middle), for outdoor ambient recording you'll need an effective windshield, and a single unit big enough to encompass both mics would be highly impractical... as would trying to mount the two mics together in separate windshields. If you really want a bit of shotgun mic focus combined with stereo ambience, it would be infinitely better to use the Mid-Sides technique and, since you already have the NTG3, add a compact sideways-facing fig-eight capsule at the base of the NTG3's interference-tube. Point of order Mr Chairman... that should read "The NT4, with its near 180-degree..."
I have a Rode Blimp too... I've found Rode very helpful when I've asked about alternative fittings... they do have them. The people at Rycote are also very helpful and keen to assist. When you know what mic you want for the 'S' aspect then I'd suggest contacting both to see what they can offer. I'm interested in this question. Mainly because I would like to know how safe/sensible it is to take studio microphones outside (rain/damp). So far I have only done this with Sennheiser MKE 600 (for video) or an Audio Technica BP4025 in a furry and Ricode BBG sphere windshield. wireman wrote: I would like to know how safe/sensible it is to take studio microphones outside (rain/damp). It's obviously not a good idea to let any mic get wet! DC-biased capacitor mics tend not to like high humidity, so damp rainey weather, and tropical rainforests can be troublesome, but RF capacitor mics (eg. Sennheiser MKH range) and most back-electrets are usually very tolerant. Wind is the other major problem, as even gentle breezes will cause a lot of low-frequency noise, especially with the more directional polar patterns. Consequently, a decen windshield system is a must when working outdoors. Rycote are the masters, but there are cheaper alternatives that are usable in less challenging conditions. When you talk about M/S mics, is Sennheiser Mkh 418s P48 a good option? Is it better to go for one mic instead of two for a good M/S setup? I'm kind of confused on how can you get a M/S image with only one mic. If I could afford it I'd always go for a two-mic set-up! But you asked about one mic... What happens is that you, typically, have a shotgun capsule with a fig-8 capsule mounted directly behind it in the mic tube - ie two mics 'hidden' in one case. How that signal gets out as two-channels can vary. The better mics will let you record the mid (shotgun) mic to one channel and the side (fig-8) to the other. Depending on your recorder you should be able to monitor in stereo even while recording the two elements separately. How you combine the two separate signals if you've recorded separately is down to what you have available. Some recorders will let you process the M and S channels within the machine. There are many free plug-ins for DAWs which do all the grunt work for you and let you blend the mid and side according to taste, to vary the stereo width or even just use the mid (mono) sound if that's preferable for this particular recording. Some stereo MS mics will give you the option of processing the MS channels within the mic to produce a variation of XY configuration to give you a left and right straight out of the mic. Some of the better Sony stereo mics give you options of, for instance, 120 degree spread, 90 deg spread or 0 deg spread - ie two mono channels. Although I've never used MS on location I much prefer to record 'unencoded' - ie M and S to separate channels and then fiddle with the stereo width in post. hcdjp wrote: When you talk about M/S mics, is Sennheiser Mkh 418s P48 a good option? The MKH418 is essentially a 416 with a built-in sideways-facing fig-8 element to provide the Sides signal. It was developed essentially to provide a stereo option for TV sound recordists who wanted to retain the familiar 416 characteristics. It will certainly provide a stereo MS signal with a lot of mid-focus, if that's what you want. I don't know how the cost compares, but the Rode NTG3 is effectively a reverse-engineered MKH416 at a much lower cost, and that combined with the clip-on Ambient Emesser I mentioned above might well work out to be more cost effective. Is it better to go for one mic instead of two for a good M/S setup? From a stereo sound point of view it makes little difference, although being able to swap out the Mid mic for others with different polar patterns can be a useful option open to a dual-mic setup but excluded from (most) single mic ones. This allows me to use omni (MKH20), cardioid (MKH40), or supercardioid (MKH50) mid mics, along with the fig-8 (MKH30) side mic, to determine the overall stereo pickup area and mid focus I want. Hugely versatile, sounds wonderful, but an enormously expensive arrangement! However, a single mic solution tends to be smaller and easier to accommodate on a shockmount system and windshield, which can be important for some people. And if the single stereo mic incorporates its own MS matrix you can audition normal left-right stereo directly which is handy of your recorder or mixer doesn't have MS decoding facilities. I'm kind of confused on how can you get a M/S image with only one mic. It's a single mic body, but inside there are two mic capsules (often three, in fact). One for the mid output (sitting at the base of the interference tube), and then either one or two capsules located directly behind it facing sideways for the Sides output.